Ever since Nikki Sivils, Scrapbooker opened up shop about a year ago, I've been intrigued by her interesting color palettes and fun designs. 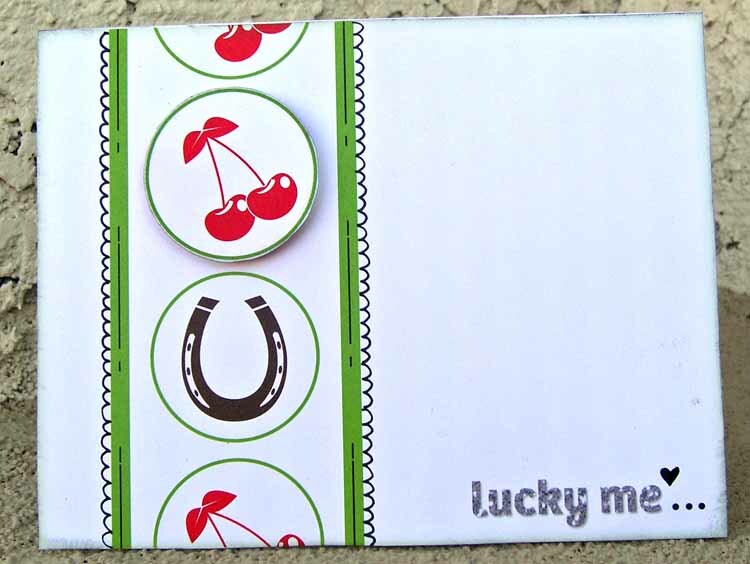 I mean, who combines cherries, horseshoes and houndstooth? Nikki Sivils, Scrapbooker does and she does it well! You can just feel her sense of humor through her paper and through the funny descriptions on the product packaging. I like that. A lot. 1. Something that I noticed right away was the versatility of the papers. They are cute, but not so cute that they are gender-biased. I found these just as easy to use with boy pics as well as girl. As a mother of boys and girls, this really means a lot to me! 2. Cool cartoony graphics. They are not something that you normally see and it is refreshing. 3. Each stamp set comes with like a billion images. Okay, not a billion, but you definitely get a bang for your buck. 1. The brad colors don't seem to coordinate well with the paper. I'd like brads that match better. 2. There aren't very many embellishments for each collection. I'd like to see more! 3. The paper on the craft flags is poorly cut. Some of them have a black line on one edge while others don't. I'd like more precise cutting on these. 1. Cut out the face. 2. Adhere it to cardstock. 3. Doodle for about 2 minutes. Adhere another cherry circle using a pop dot to give my card some dimension. That's it! One thing to be aware of is that the chipboard albums do not come with any pre-punched holes. As long as you have a good punch, this isn't a problem. In fact, this gives you more creative freedom which I love. But if you don't have a hole punch that will go through chipboard, you'll be pretty frustrated and stuck with pieces of a mini album. 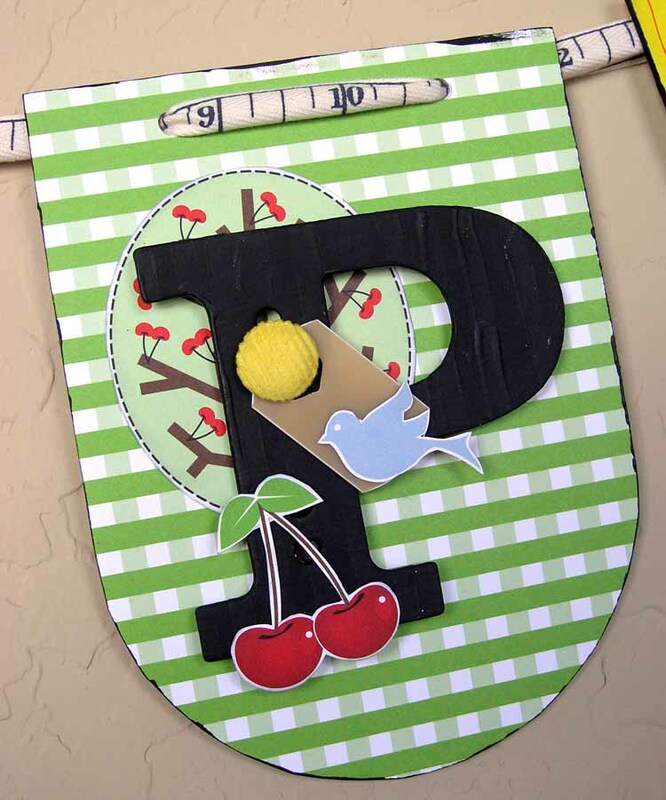 Here are pictures of each letter so you can see all the fun details. 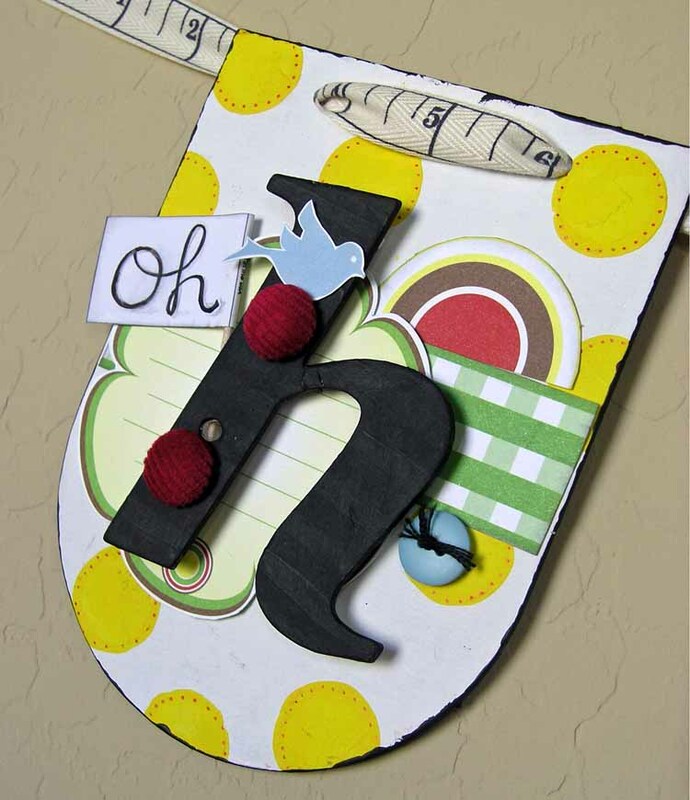 Nikki Sivils, Scrapbooker is a company to watch because they really think outside the box. I can't wait to see what they come up with next! What Do You Think? What do you think of Nikki Sivils, Scrapbooker designs and color combinations? Are you inspired by their products? I'd love to hear from you! Leave a comment by noon EST Saturday and be entered to win the fabulous prize pack seen below!! These are beautiful products - I often see online projects that used this brand, but have not seen them in the stores. The sample projects are gorgeous, and I especially like the mini-album pieces and the way they were used to make the banner - what an awesome idea! Very cheerful! The mini banner is so cute. I had heard others mention Nikki at CHA last summer, but not much advertising since. Thanks for spotlighting her designs. I love the banner you created! These products look pretty cool. I like them. Thanks for a chance to win. Great projects used with the products!!! Love the neutrality of this set! The colors are that you can use this with all sorts of different pics! I met Nikki through your message board and saw her product when she was just in the beginning phase. It is so awesome to see how she made her dream a reality! Love her products! Go Nikki! I loved the Henry's Brillance line from her last release. Can't wait to get these new ones. Great review on the embellies...that's why I come here before purchasing things I can't see (online). Great giveaway....(fingers crossed). I love the NS stuff every time I see - would be great to win some! Thanks for the review. We are working hard to get into all the retail stores.... just takes time when you are brand new!! Thanks again for the great review!! I just got my first paper from her and love it but I know what you mean about not enough embellies. Her stuff is too cute not to make embellies to go with it. I have never heard of this line. But I do love this sneak peak. The colors are wonderful. Thanks for the chance to win. Hi. I haven't heard of this line before, so thanks for introducing me to it. Looks like Nikki's done a great job. I'd love to play with her products.. And I must say, I don't agree that the brads should match exactly... I love it when elements on a page aren't so matchy, matchy. Gives it more oomph and pop. Very cute paper!! I have mostly boys to scrap and this would be a great line to use for those boyish pages!! Your projects are so cute!! Thanks for the great review! I enjoyed your review and like the patterned paper. Would be fun to see it all IRL. Everything looks like a lot of fun! Neat embellies and fun papers! Thank you for sharing your thoughts on this line. I've been really back and forth on it, but I have to say that your pages and your banner really came out cute! They look really cute but I haven't seen them in stores yet. Do I like Nikkin's stuff? HECK YA is an understatement! I drool over it and sooooo wish my lss would carry it! Some of her products are cute, but I feel like some are just re-hashes of other lines from different companies. What great projects you made. Thank you for showing the whole lines. Did not know there were things besides paper. I just realized I just used 2 pieces of her paper last week, thought the couch look familiar, lol. 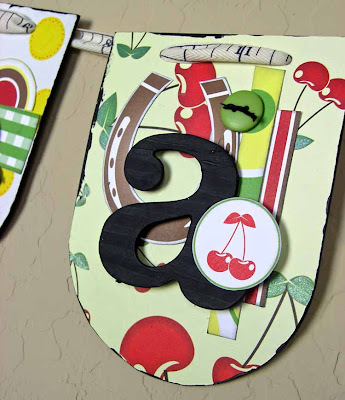 I love your project, especially the banner, the colors are fab. I haven't heard of this company before but am looking forward to seeing what they do in the future. I feel Nikki brads match perfectly with the "My Sweet Cherry Pie", "North Pole Nights", and "U R My Favorite" lines! And for those that haven't seen them at your LSS, tell them to get it ordered! Her Christmas line sold out, your doing your LSS a favor by bringing this company to them! Love the bright, fun colors! WOW those products are beautiful and would inspire me to make wonderful layouts and beautiful things!! I would LOE to make these my own. 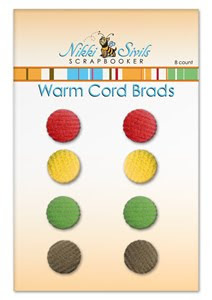 I LOVE Nikki's products and purchase them at my LSS , Photolicious Scrapbooking & Gifts in Buffalo, Texas. I think they are perfectly coordinated and the "whimsy" really appeals to me. She is on her way to "stardom" in this business! I love you guys for the awesome reviews. I love that fun prize pack. I am feeling the love today. Thank you! it looks like a fun line! Love all your creations, especially the first layout! Great stuff! Interesting collection... I have not seen this in my LSS. I will be on the look-out! Great review Bethany! LOVE the banner!! 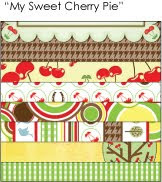 I love the "My Sweet Cherry Pie" collection. The color scheme and whimsical desings are too cute!! 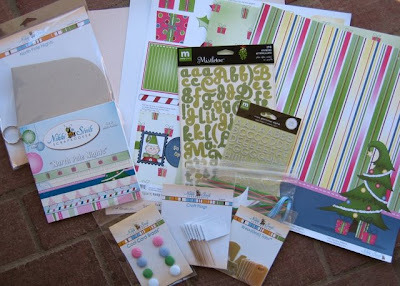 I wish I could find this paper line at the local scrap store!! I am so inspired by that line, especially that "Oh Happy Day" hanging. It is just gorgeous and just plain fun!!! Gimme, gimme some of this. I'd never heard of Nikki Silvis until just today, thanks!! Very cute...love the color combo of the Sweet Cherry line! I love the Sweet Cherry Pie pack. Thanks for the chance to win your give-a-way. I really love her designs. I saw them up close and personal At CHA and met and talked with Nikki. 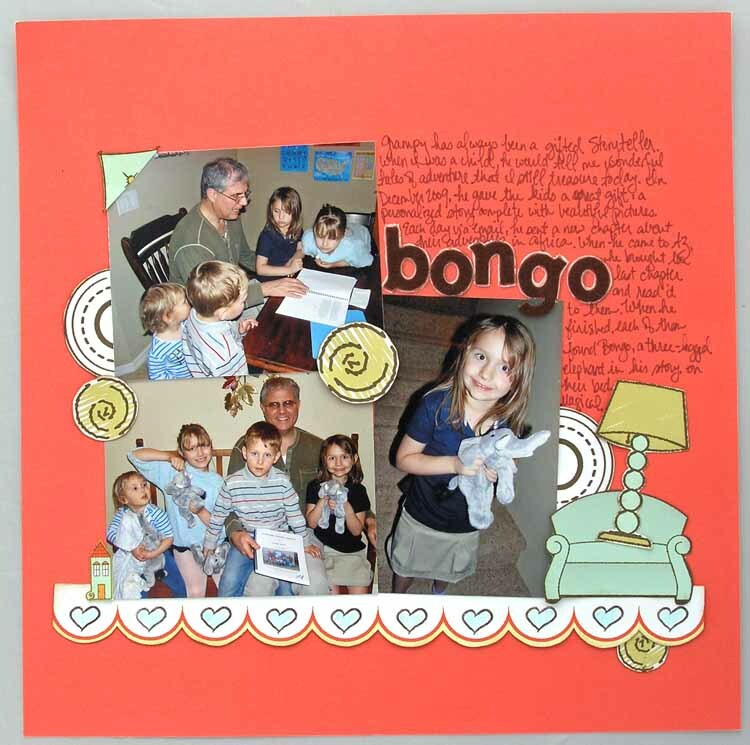 Her scrapbooking design certainly reflect who she is...a lot of fun. What a cute line! Thanks for sharing! I love those little flags! Fun Fun Fun! Oh I am hooked. Just too dang cute! I love the paper and your great ideas. I know I am going to lift the double border. It's really cool! Maybe she'll create more brads?! LOVE LOVE the banner! 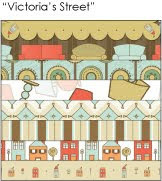 Victoria's Street grabbed my attention. Very cute and I loved the colors. Intriguing. That product would be super fun to create something with. I've been eyeing up Nikki Sivils since it popped out on the scene, but can't find it locally. I'd love a chance to play with some. You did a great job with those goodies! 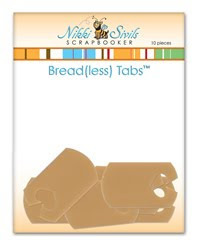 I've been noticing the Nikki Sivils products more and more. I like what I see! I love her paper.So cute..
Bethany, Great review! I think these products are adorable!! 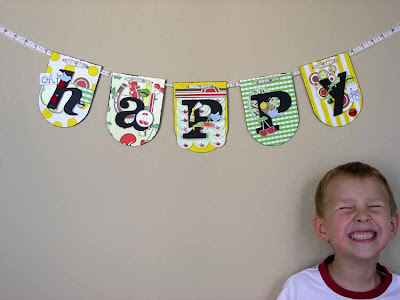 I love the variety of projects you made and especially the cute "happy" banner. That is something I would scraplift. 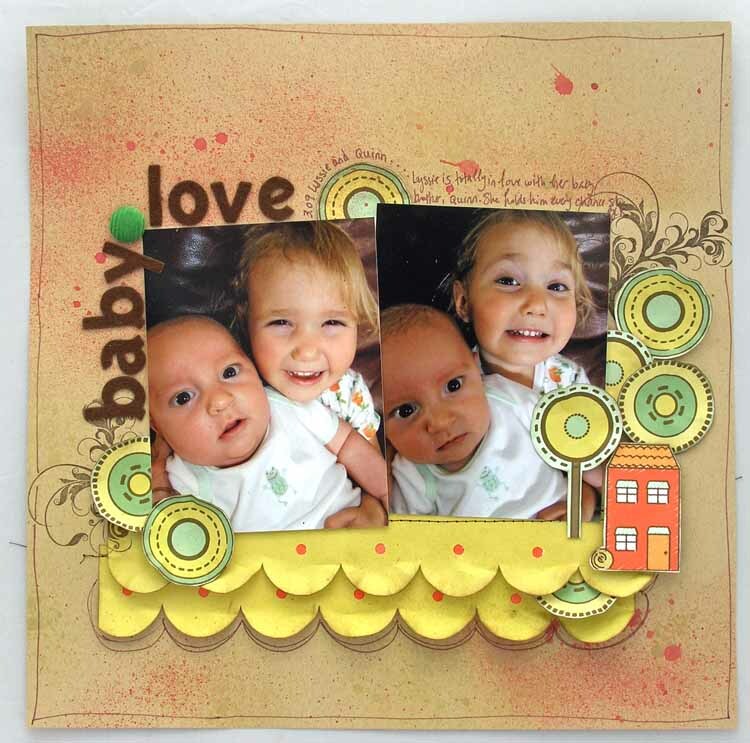 I think I would love the versatility of unpunched chipboard to use for an album or a banner or decorations etc. 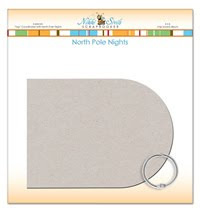 My favorite papers are from the North Pole Nights line - I love pink in a holiday line! 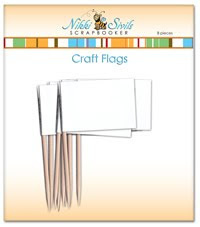 Thanks for the review about Nikki Sivils, Scrapbooker! I enjoyed getting a look at these products. I love Nikki's cherry-themed stuff. Just finished a couple of layouts; would love to get my hands on more. I am not one who usually likes the “cartoony” paper and this paper wouldn't normally do it for me. Your projects really helped me to see some potential. I think cutting it into various embellishments works and I agree with you that there aren’t enough embellishments in the collection. 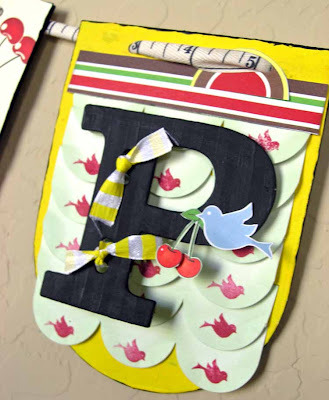 I would love to cut up some of that paper into various embellishments and use it that way. I also make a lot of cards, and agree with you that this paper is great for making them quick and easy but also fabulous at the same time. I really like the letters. nice details. I also like that the chipboard albums don't have pre punched holes. as you said that would leave lots of creative room. I really like her line of products. I haven't gotten to see any up close in person but I can tell from what I have seen, that it is definitely a company that will go far. I haven't seen any of these products. Would love to have some. Great projects and LO's. I think the products are really cute. I would love to play with them! I don't know what I'd use if for but I want that couch paper! Berry Fun...lol I love the colors.. I have seen some of Nikki's collections on line, however I have not seen this collection. Very cute and quirky design. Thanks for the review. I love your projects and clear directions for the projects. Love the color combinations. The line is very cheerful! I like the colours of the paper and embellies, because it's not too sweet or girlie... and the paper leaves room for interpretation. Most pattern paper are "too obvious" and that way I'm stuck with bounderies (hard to explain in English, I'm Dutch, but you know what I mean?) I'd love me some Nikki Sivils goodness! I love her designs. They're just so darn happy. It's quite refreshing. I'd love a chance to play with some of her product. Ooooo....That does look like a fabulous & fun giveaway pack! I love her colors for the season-the pinks and greens are super cute! Love getting away from the traditional colors and stepping outside the box...thanks for the chance to win! Fun line. Great projects! Off to look at more NS,S stuff. This an awesome line I absolutely love the colors !! 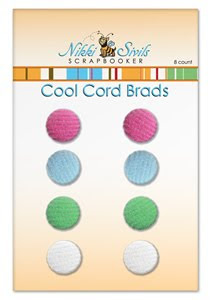 Thanks for reviewing Nikki Sivils, Scrapbooker - the products just scream lots of fun, haven't heard of this brand and doubt my LSS has any, would love to win - cheers! I love the colors. They're so bright and cheerful. Thanks so much for the chance to win. Loved the happy banner...reat review..thanks ! Very cute collection! Hope it's my lucky day!!! Very cute. 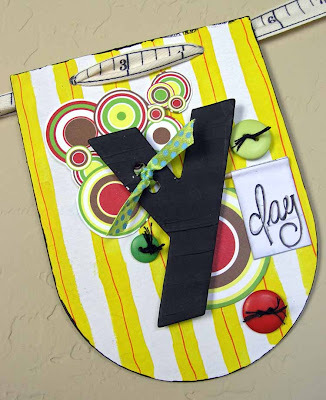 Very playful designs! Great designs to get your creative juices flowing.